Early American Explorers operated under the concepts, "If I see it, I can claim it for my country," and "I'm stronger and smarter than you, so it should be mine!" (In other words, "Finders Keepers," and "I'll fight you for it!") The civilizations who were already living on the American continents didn't agree with these beliefs (would you?) and wars resulted between colliding cultures. Europe didn't have a "No Bullying!" program at that time. Leif Eriksson is best known as the first European who set foot on the American continent nearly 500 years before Columbus (about 1000 a.d.). Born in Greenland, 2nd son to Eric the Red, Leif sailed to Norway where he was converted to Christianity. He returned to Greenland where he converted his mother and built Greenland's first Christian church. While sailing back to Norway his ship went off course and he landed in what we call Nova Scotia. He named it Vinland. Christopher Columbus was an Italian who lead a Spanish expedition searching for a direct sea route to the East Indies (Asia) to more easily trade spices, silk, gold, and jewels. His three ships - Nina, Pinta, and Santa Maria - landed on the islands southeast of Florida on October 12, 1492. After a few months exploring the Caribbean Sea, he returned to Spain with parrots, plants unknown to Europe, and six kidnapped Taino people, natives who inhabited most of the islands. ﻿Juan Ponce de Leon﻿ sailed with Christopher Columbus on one of his voyages to American in 1493. Rather than return to Spain with Columbus, he stayed in the Bahamas where he was made Governor of a small province. Rumors of great wealth on a neighboring island lead him to conquer the natives of that island and treat them cruelly. This was looked down upon and he was removed from his office. Ponce de Leon is most known for his search for the Fountain of Youth, a spring of water that was rumored to keep you young eternally. In his quest he discovered a land of flowers, which he named Florida (which means "covered in flowers" in Spanish). 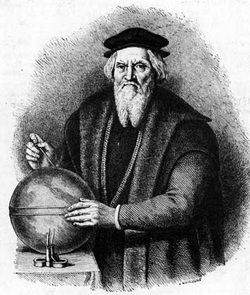 John Cabot tried to find the Northwest passage on the ship Matthew in 1497. Though born in Italy (Giovanni Caboto), he sailed for King Henry VII of England and claimed Canada for the King, mistaking it for Asia. He had been inspired by other Age of Discovery explorers, including Christopher Columbus. As a young and successful mariner navigator in Venice, Italy he heard that there were opportunities available in England for captains to set sail for the New World. For centuries it was thought that he was lost-at-sea in his last venture to the northeast coast of North America, but recent evidence shows that he was probably back in England by 1500. 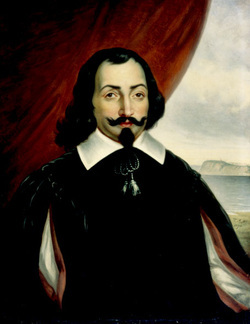 Vasco Nunez de Balboa is considered the first European to see the Pacific Ocean. He saw the eastern Pacific shores from the top of a mountain in Panama. As he waded out into the water, he claimed all of the ocean and its shores for Spain in 1513. Having been born in Spain during the Age of Exploration, he had dreams of going to the New World to get rich. He joined an expedition to Hispaniola (Haiti and the Dominican Republic) and got into debt while living there (lost all his money). He ran away, which lead him to his stay on Panama where his travels took him westward where he saw the Pacific Ocean. A jealous government official had Balboa beheaded in 1519. Ferdinand Magellan ﻿was the first explorer to sail completely around the world for Spain in 1519. At first, he had sailed from Portugal to India going around the southern tip of Africa. He felt that he could sail west across the Atlantic Ocean to find India, and sailed around the southern tip of South America going from the Atlantic Ocean to the Pacific Ocean. At one point, three of his five ships tried to mutiny (defy his authority and take off), but Magellan fought the traitors and had them executed. The Straits of Magellan at the southern tip of South America were named after him. 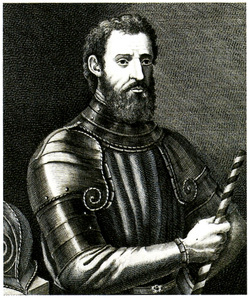 Giovanni da Verrazzano was born in Italy, but sailed his expeditions for France. He traveled to France in about 1520 where he met King Frances I and became acquainted with the French Navy. During this time, Christopher Columbus, Amerigo Vespucci, and Ferdinand Magellan were making claims in the New World for Spain. King Francis I wanted a part of the treasures of the New World. He sent Giovanni to explore the Americas, which resulted with discoveries from the area we now know as North Carolina up to New York Harbor. Verrazzano made three trips to America, and was eventually killed (along with several of his crew) by cannibals on his final voyage. 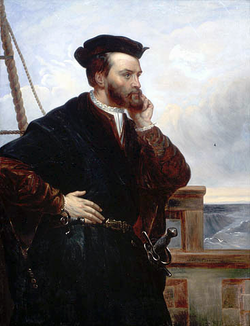 Jacques Cartier was born in France and sailed for King Francis I to find riches and spices - and the Northwest Passage to Asia in 1534. He had previously sailed to the area we call Brazil in South America and was asked to head expeditions to the northeastern coast of the new World. On his first voyage for King Frances I he discovered what we call Newfoundland, Prince Edward Island, Anticosti Island, and the St. Lawrence River. On his 2nd voyage he explored the area that became Montreal, Canada. He also kidnapped several Iroquois chiefs and took them back to France. His 3rd journey was a colonization mission, but he found what he thought was gold and diamonds. He abandoned the colonists and returned to France, only to find out that the gold and diamonds were not genuine. Francisco Coronado, a Spaniard, ﻿explored the southwestern part of the United States in about 1535. He also went as far as the Great Plains of Kansas. Rumors of El Dorado, a gleaming city of wealth, and talks of Seven Cities of Gold enticed Coronado to revisit the Southwest in the 1540s. On his way back home he discovered the Grand Canyon. He came back to his wife and eight children empty-handed; there were no treasure cities to be found. After arriving back, his superiors found him guilty of committing atrocities against the Indians and had him sent to Mexico City to work in a humiliating, minor government position. Francisco Pizarro grew up in Spain and never learned to read or write. He was a pig herder before heading to the New World to be a colonist. While there he befriended Vasco Nunez de Balboa and joined him in his expeditions. Later in 1532, Pizarro ventured off on his own to find rumored gold and treasures from South America, specifically Peru. By trickery he captured Atahualpa, the emperor of the Incans and demanded a room full of gold as a ransom. The ransom was paid, but Pizarro executed Atahualpa anyway. Pizarro founded Lima, Peru which is still the capital of Peru today. Hernando De Soto left his home in Spain when only 14 years old to explore Central America. His father was noble but poor and wanted Hernando to become a lawyer. Hernando wanted to be an explorer, a more exciting profession. He was a great horseman and once he ventured off to the New World he was bold in his trading with the natives which lead him to become very wealthy. 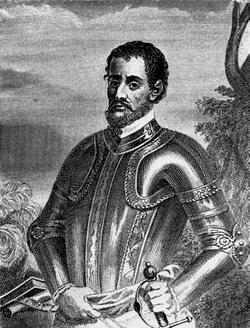 He accompanied expeditions with Francisco Pizarro and later played a major role in the conquest of Peru and amassed a fortune from the Inca Indians. Though he returned to Spain a rich man, his restlessness lead him back to America where he explored Florida and eventually discovered the mouth of the Mississippi River in 1539. It was on this expedition that he contracted a fever and died. His crew buried him in the Mississippi River that he had discovered for his country, Spain. 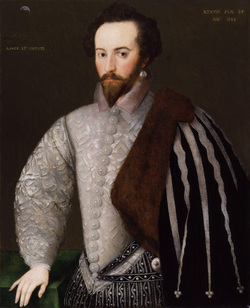 Sir Walter Raleigh was born in England and studied at Oxford University before joining the French Army. He later served in the English Army for Queen Elizabeth, who had him knighted in 1585 giving him trade privileges and the right to colonize America. In ﻿1587﻿ Raleigh lead an expedition to America and set up an ill-fated colony called Roanoke in a territory he named Virginia. Though he was successful in many ventures as an explorer and military man, he angered Queen Elizabeth by marrying one of her maids-of-honor. This landed him in the Tower of London (a prison). He was released and later brought potato and tobacco plants from the New World to England. He was a gifted poet, writer, and scholar. Samuel de Champlain, a Frenchman, sailed to Northern America in 1603 and colonized New France with the settlement Quebec. This city would become the major hub of the French fur trade. While there, he continued to explore the area and mapped the Great Lakes and northeast coastline. In 1620 he was named Governor of New France. He sailed as far south as Cape Cod, and gave a detailed description of what became Plymouth Rock. Champlain had fought the Iroquois Indians and befriended the Huron Indians, who were also enemies of the Iroquois. Because of his friendship with the Hurons, he wrote detailed accounts of Indian life in the New World. Though the English took control of Quebec for a while, it was later returned to French control. 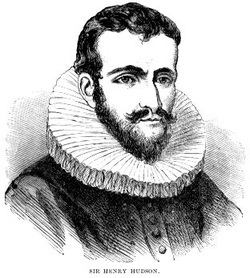 Henry Hudson was en Englishman, born in London around 1565. His main purpose for exploration was to find the elusive Northwest Passage - a way to reach China going west across the Atlantic Ocean from Europe. Though his first two trips beginning in 1607 were unsuccessful, his third trip discovered a bay that was later named after him, the Hudson Bay. This bay is where New York City became established. He relentlessly tried to discover the Northwest Passage, but met his fate on his fourth voyage. Most of his crew mutinied against him, placing him and several other loyal crew members on a small boat, setting them adrift in Hudson Bay. The main ship, Discovery, returned to England. Hudson was never heard of again.